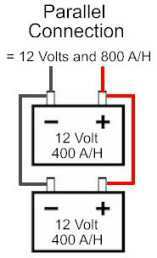 Parallel 12 volt battery connections increase A/H ( Note 1 ) and keep the voltage the same. 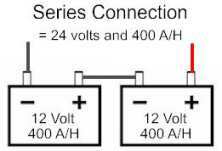 Series 12 volt battery connections increase voltage to 24 volts and keep A/H ( Note 1 ) the same. 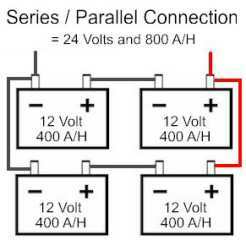 Series and parallel 12 volt battery connections increase voltage to 24 volts and increase amperage. Note 1: A/H stands for Amp Hours. Amperage, also know as current, is the amount of electrical energy flowing through a line or wire at any given time. Measurement units are called amperes, amp or amps.